Project: Rising Sun Coffee Co. The following is a brand package I designed. I started with a mood board which led to the logo, a bison and sun rays for the Rising Sun Coffee Co. The facility is directly in front of a buffalo farm, and for this reason I felt like the imagery was appropriate. The color scheme was meant to grab attention and provide a nice contrast to the other earthy tones in the brand palette. I continued to develop the brand with front-end web design and the infographics on the 'about' page. I used coffee-like tones with warm tones to give it a homey, hand-crafted feeling. At the bottom, you'll see a bag and cup design. Click on any image to view it larger. 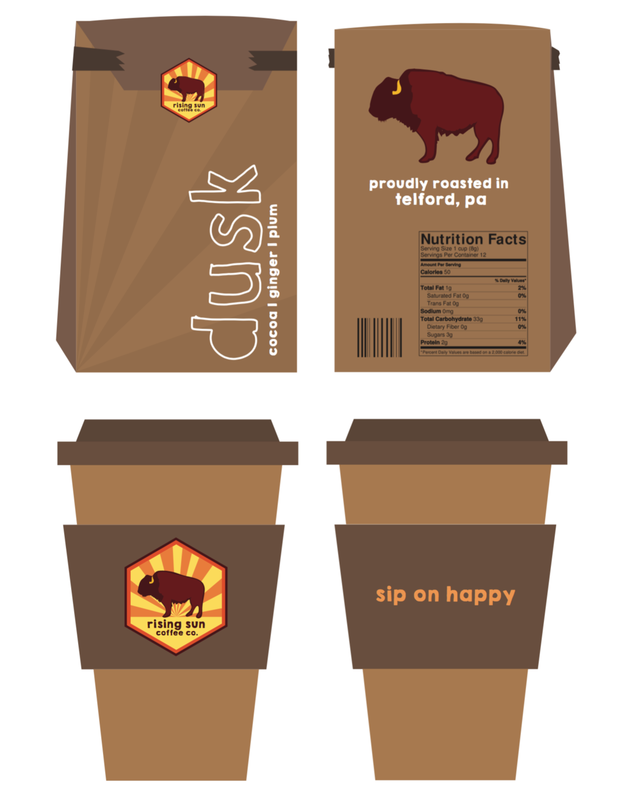 The following is an example of the coffee bag design, and a coffee cup design. These would be the two pieces they would need to have a successful set up at a local festival.